Service Six. From right: myself, Racquel Bruno, Josh Abejero (back), Julie Gabat, Raymond Lozada (back), Amy Lopez, Jing Lagrada, Bea Eusebio (back), and Mia Licyayo. TWO DAYS left, and I'm done with my first stint at the Charity Ward as resident. It's where much of the action happens. The first year's roller-coaster life—victories and failures, recoveries and morbidities—essentially revolves around Wards 1 and 3. 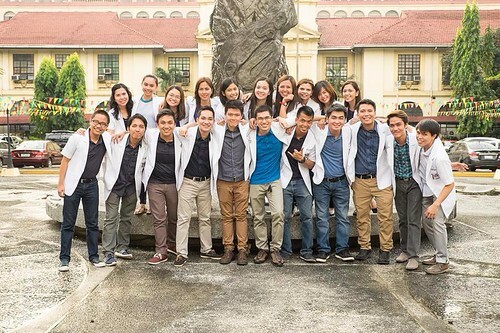 I HAD the immense privilege of helping Rich King, our batch head, compose the speech for the welcome ceremony for incoming first years in the Department of Medicine last week. His delivery gave this short message a more serious, determined tone; and he spoke like a seasoned orator. Here it is, in full. 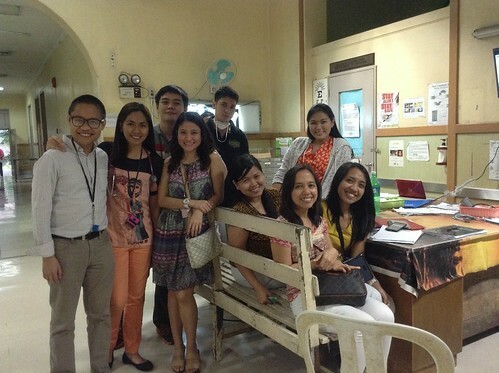 It still baffles us: the fact we made it to residency in Internal Medicine at the Philippine General Hospital. When we look back at the rigorous pre-residency process just a few months ago, we had no way of knowing whether we were going to get in at all. There were so many applicants, many at the top of our own classes, all oozing with brilliance and compassion, so much so that in the end, we felt it was anybody's game. We wouldn't feel cheated if we didn't get in and they did. And yet, by God's grace, by a beautifully orchestrated miracle, we received the call one fateful afternoon. Some of us were still curled up in bed, or watching a movie over our laptop, and when we heard the resounding, “Congratulations! You made it!”, many of us couldn't believe our ears. Our lives finally took a new direction for the next three years. LAST THURSDAY night, during my time with the Pilgrim Men—the Bible study (or cell) group I've had the privilege of attending in church—we shared what made our year memorable. The question was, in effect, like this: what criteria do we employ to say that our year has been a success? MORNING always has us scrambling for charts—not an easy task at all, but one that requires the visual acuity of an eagle, the extraordinary flexibility of a snake, and the father's forbearance in the Parable of the Prodigal Son. I WELCOMED the new year in the hospital. I was on 24-hour shift at the Pay Ward, intermittently called up by nurses for referrals that ranged from possibly fatal complaints (difficulty breathing or chest pain) to electrolyte abnormalities easily corrected by telling the patient to eat a piece of banana. I had brief moments of rest, perhaps the longest ones I've had since I had begun residency two weeks ago. From the call room window I could see fireworks decorating the expanse above Manila Bay. I imagined that, if I were home on New Year's Eve, my street at St. Gabriel would be noisy too. I could see our dog, Benjamin, cowering in fear whenever our neighbors lighted fireworks. The Dizons, who live just right across us, would call us up and invite us to their home; I wonder if their family computer, which we always fantasized about, is still working. My parents would probably be asleep, especially my mother, who cannot tolerate staying up late lest she incur a migraine the next day. But Tatay would wake me and my brothers up sometimes—that much I can remember when I was in elementary school. He would give us firework sticks and light all three of them at the tips with a single matchstick, assuring us that our hands wouldn't need to be amputated because that hardly ever happens if one is careful. I was particularly paranoid; I liked my hands very much.